He always disappeared in the winter, though I never knew where he went. I assumed somewhere warm, but he never said. I still wonder why we called him Tiger. Surely his mother hadn’t named him Tiger. It was a nickname that upon growing older had became the only identity he wanted. He called himself Tiger, and we called him Tiger. Whatever else he had forgotten, he always knew that he was ‘Tiger’. Every day I went to work I spent my mornings with the man. Tiger came to borrow the bathroom in the bar while I set up shop for the day, before the rest of the staff arrived. After Tiger used the bathroom, he would stay a little while longer to chat with me and then duck out before the customers started queuing up outside the door. He knew it would be bad for business if anyone saw him sitting at the bar. He knew he was insane and he knew that people didn’t like him. He even knew their reasoning. Tiger was scary. He was embarrassed for himself because he knew he was scary. He would lose himself to the voices in his head and pace little hurried circles in the street, while holding a hundred screaming dialogues at once. He was crazy when he was trying to finish all those conversations, but when those conversations were exhausted he would finally get quiet again. He would sit in the park, and sit so still that the natural world forgot he was there. I always saw little birds sitting on his hat on those occasions that Tiger was empty. Whatever his condition may have been, whatever led him out into the streets to sleep in the cold, however many countless psychosis he possessed, I only ever label one of them. Tiger was a man who had entirely lost track of time, and the world around him had stopped moving in a linear way. He lived too far in the past and the future to have any grip on the present. He couldn’t hold a conversation for more than a few seconds without recalling the conversation he was having with someone who wasn’t there. He couldn’t find the time to finish a conversation with you, so he found the time while he was walking the streets. His garbage bag of belongings slung over his shoulder while his mouth finished a conversation with a person who had long since walked past him. The last time I saw him it was late autumn and very cold. It was almost time for Tiger to disappear again for the winter. I asked where he was sleeping. “Oh I’m sleeping just fine,” he mumbled, which was unusual. When he spoke you could tell that he was trying to be heard over the noise of countless conversations he was holding with Tigers of the past, present, and future. That was the larger voice. His soft words, his mumblings, were reserved for the small conversations. This was how I knew when he was talking to me. “Sleeping under the willow tree,” he continued. Manhattan has a limited number of willow trees and I knew none of them, but apparently Tiger had a willow tree, and he preferred it to the bunk of a shelter filled with homeless people. Tiger did not feel that he had much in common with homeless people. He asked softly and politely for me to “loan him some anti-freeze”, but he knew I couldn’t give him liquor. I could lose my job. He knew, but he still asked. He told me a story then, about his friend who had died. I remember how death was on Tiger’s mind that day. Something was different about him. He was afraid of the knife I cut lemons with. He had to be reminded when it was nearly time for me to open up for the day. That was the first time he hadn’t wanted to leave. He eventually left in the same way he always left; halfway through telling me a story. His voice was raised to that larger voice that spoke to no one and I could hear him walking away down the street, throwing his voice out in to the universe where, he seemed to think, it would have a way of finding its way back to me. Winter came and went and Tiger was gone. I am not surprised that he is gone. Disappearing is often the last crazy thing to be done. 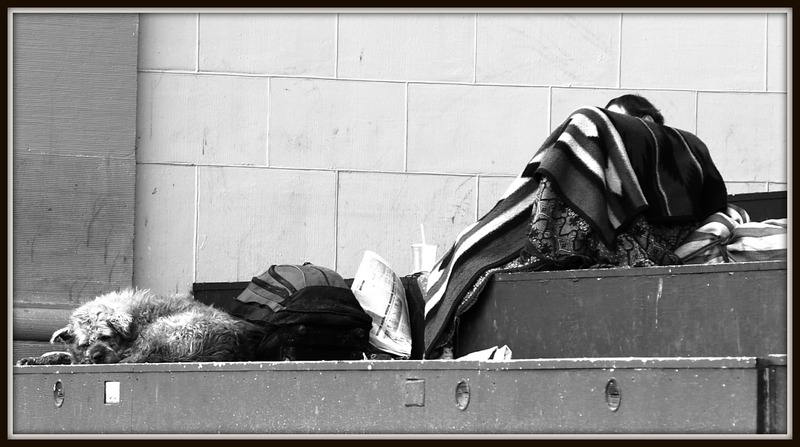 Vanishing is part of the homeless occupation, and one day, unbeknownst to the rest of us, they are gone. So I simply assume that somewhere there is a willow tree, where Tiger remains sleeping, covered in birds, at its roots.